Hi! 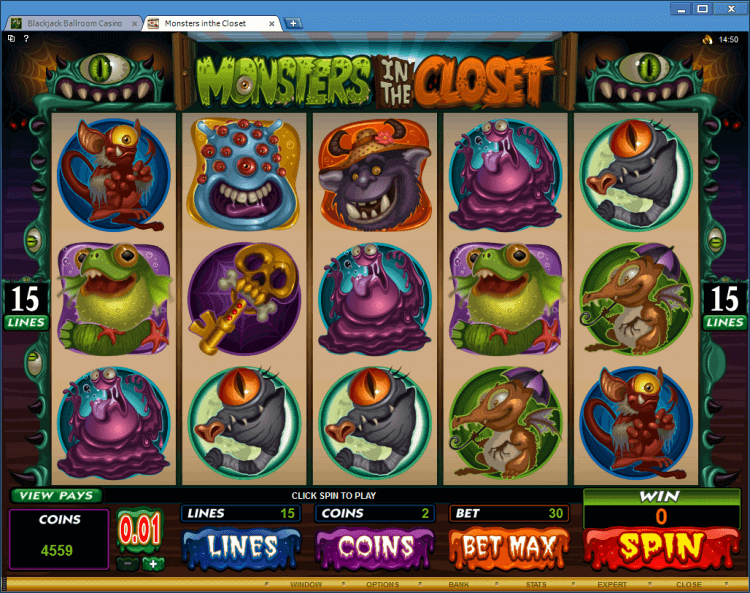 Let’s play Monsters in the Closet bonus slot at the BlackJack Ballroom online casino app. 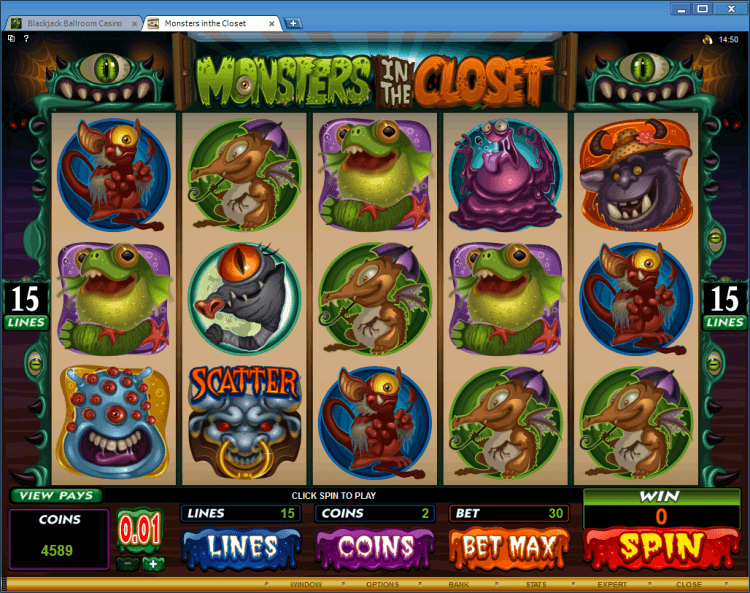 Monster in the Closet is a five reel, fifty payline and five hundred coin slot machine. The Monster in the Closet symbol is a wild symbol. This symbol doesn’t substitute for the scatter symbol and creates its own winning combination. The Key symbol and the Door Knocker symbol are scatter symbols. The Key symbol completes a winning scatter combination when three or more appear on the reels and the Door Knocker symbol completes a winning scatter combination when two or more appear on the reels. 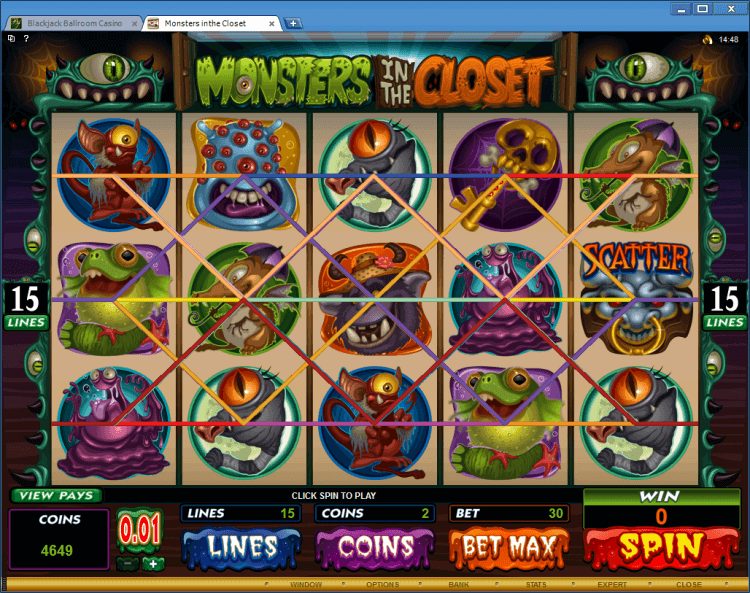 Three or more Key Symbols scattered on the reels, activate the Closet bonus game. In this game you can win up to 100 000 coins. Three or more Door Knocker symbols scattered on the reels, activate the Free Spins bonus game. In this game you are awarded 12 frees spins, all wins are tripled during the free spins and you can win up to 60 000 coins. Hi there! 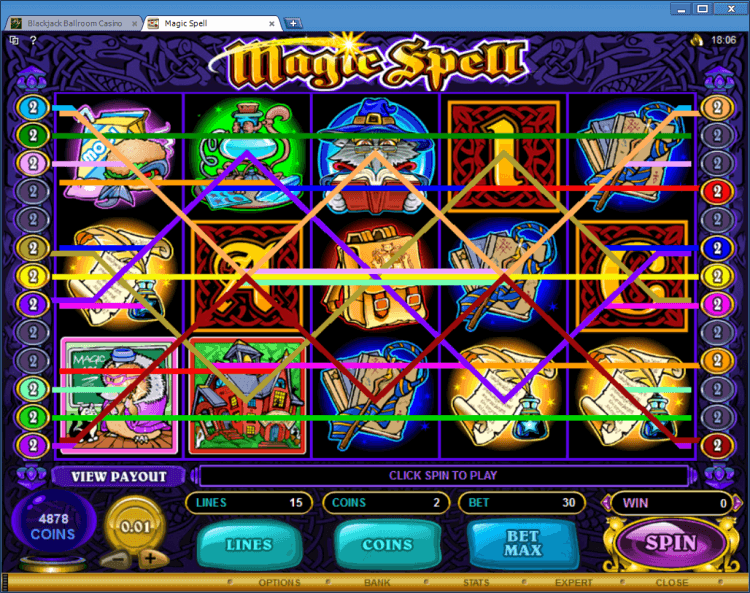 Let’s play bonus slot Magic Spell on application online casino BlackJack Ballroom! 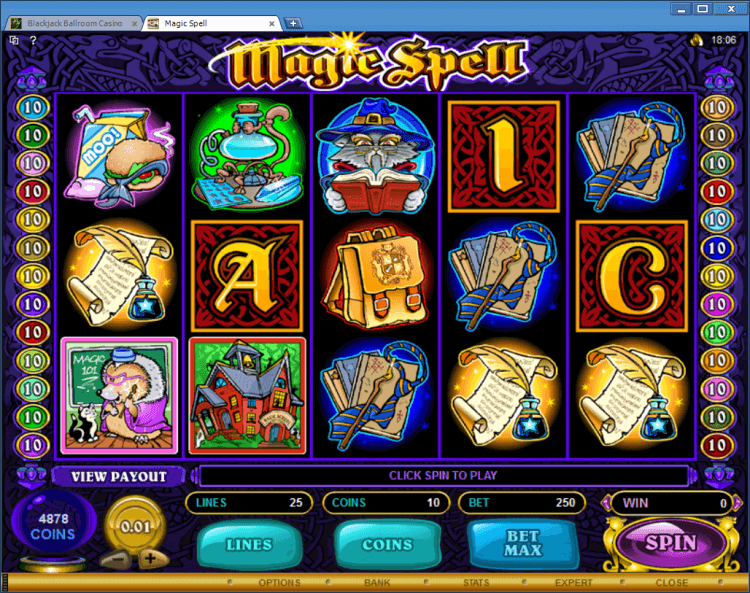 Magic Spell is a five reels, twenty five payline and two hundred and fifty coin slot machine. You must to remember, that all payouts are in coins, but you can converse coins to real money at any time! The Master Tom symbol is a wild, multiplier symbol. This symbol creates its own winning combination. Multiplies the payout of any combination it completes as a wild symbol. 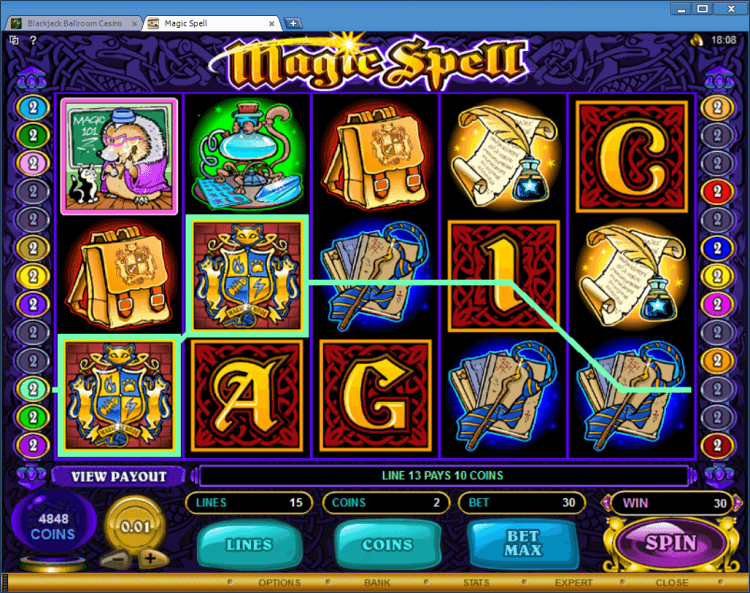 All the M-A-G-I-C symbols must be displayed in order spelling the word magic, on reels 1 to 5 to activate the Magic Spell bonus game. In this game you can win up to 75 000 coins. And now I will tell you the most interesting! 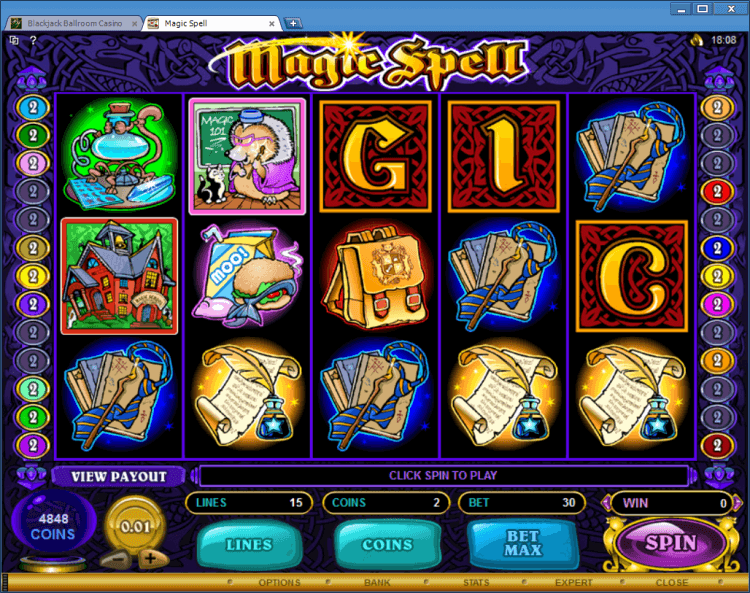 If you find a Key symbol is the Magic Spell bonus game, the Secret Library bonus game is activated. In this game you can win up to 75 000 coins!